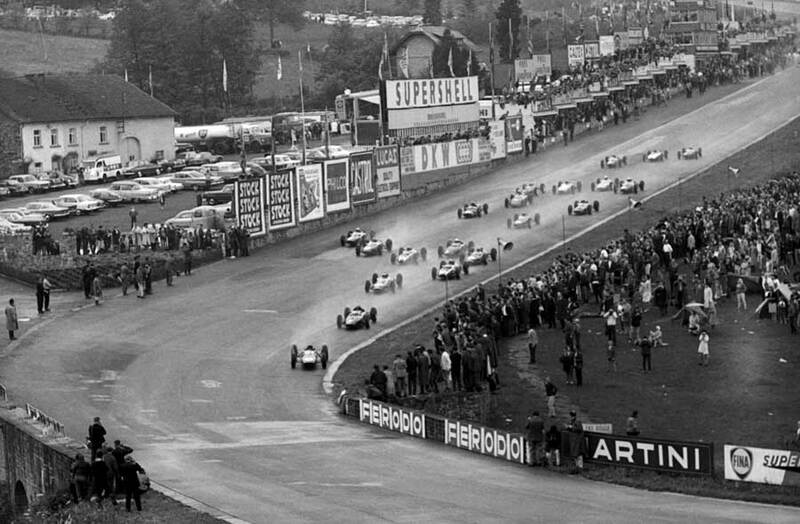 With thunder, lightning and torrential rain blasting the Ardennes circuit, Jim Clark stormed to victory in the Belgian Grand Prix, leading from start to finish. The weather was so bad towards the end of the race, that Colin Chapman, head of Lotus and Tony Rudd, BRM's chief engineer, asked officials to stop it, but their pleas were ignored and the full 32 laps were completed. This race was notable for the debut of the new ATS team, set up by former Ferrari chief engineer Signor Carlo Chiti, with Phil Hill and Giancarlo Baghetti as drivers. They had to wait for their cars to arrive because of customs problems at the Belgian border, and were unable to take part in the practice sessions. As a result, both started at the back of the grid, and were forced out with gearbox problems before halfway. Graham Hill started on pole, but it was Clark who got a sensational start from the third row, taking the lead after only one lap. He soon pulled clear of Hill and after eight laps was over 13 seconds ahead, making up an extra second on each lap. By the halfway stage, Clark was 27 seconds in front of Hill, and when, on the 18th lap, thunder exploded overhead, Hill was forced to retire when his gearbox gave out, leaving Clark to drive on to victory. Dan Gurney now lay second in the Brabham Climax, with Richie Ginther and Bruce McLaren fighting it out for third. The weather then deteriorated rapidly, as lightning forked down through the pine forests and the rain became heavier and heavier. Twenty-foot plumes of spray trailed behind the cars, making visibility for the drivers almost impossible. Clark said afterwards; "Towards the end visibility was appalling. I had to hold the car in top gear for most of the race and my speed was dropping by nearly 100mph in the last stages. Some cars were spinning off on the straights and it was extremely dangerous." Clark, driving brilliantly in the conditions, managed to splash his way to victory well ahead of the five other cars that finished. The pace was drastically slowed in the last six laps as the drivers had to shield their eyes from the blinding rain, making it extremely difficult to drive at high speed. McLaren managed to claw his way up into second and picked up six championship points, putting him ahead of Clark and Hill by one point.